Thanks to MomCentral and Baby Einstein I had the chance to host a Playgroup Premiere with our weekly playgroup (eight children from four different families). We celebrated the release of Baby Einstein's new World Music DVD. 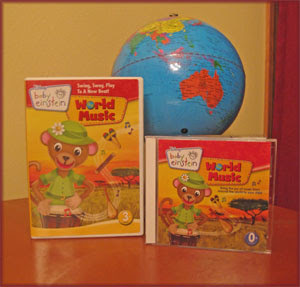 Our World Music party pack included the World Music DVD, CD and Baby Einstein branded party supplies, coupons and growth charts. A festive lunch and festive world music equaled a magnificent time had by all. The kids enjoyed grooving to the beat of the new Baby Einstein DVD and impressed us with their dancing skills. They especially enjoyed watching Jane, the monkey puppet's antics. The faster beats drew them in more as well as one of the final songs named "This World, Our World" sung by children. 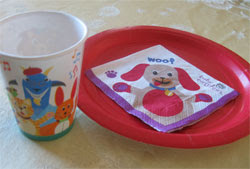 They also LOVED using the Baby Einstein cups and napkins for our luncheon meal. Get out your drums, shake your maracas and flip a rainstick. The Baby Einstein World Music DVD features songs and music from around the world in performed in the typical mellow, synthesized Baby Einstein fashion. Images from each of the seven continents and a variety of musical instruments accompany the music. Jane the jet setting monkey flies a plane over a spinning globe and takes babies and kids along for the journey. The monkey also stars in the silly puppet shows that break up the segments, each segment featuring a different continent. The DVD includes a few new play modes: "Grow with Me", "Select a Segment" and "Discovery Cards." The main feature runs 37 minutes. We prefer viewing mode 2 over viewing mode 1. Intended for toddlers and kids, the "Grow With Me" viewing mode (#2) plays the images along with text and spoken language, instead of just visuals and music. Also, the kids really enjoy the DVD when I bring out some instruments for them to use while viewing. The instruments featured in the DVD are a wood flute, maracas, a rainstick, didgeridoo, djembe (drum), harp, and pipa (stringed instrument). My kids especially like watching the bonus Select a Segment: World Music Songs. Sung by children, the songs include "Shoo Fly", "Aloutte", "Arroz con Leche" and "Kogame, Kogame". To be honest, I was expecting a little more lively variation of world music from Baby Einstein. The slower tempo segments (Africa, Asia, Antarctica) aren't as interesting for my kids as the upbeat ones. We are used to listening to Putumayo label music and would have liked to see Baby Einstein incorporate more energy in their musical selections this time around. I also wish the segments included more images of babies from around the world and fewer landscape/water shots. The DVD and CD are recommended if you want calming, soothing world music and have enjoyed previous Baby Einstein music products. Enter the Baby Einstein - Year of Discoveries Sweepstakes each month this year for a chance to win some great Baby Einstein products. Prizes include a $1,000 Series I U.S Savings Bond.